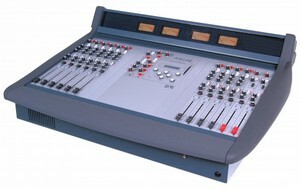 AIRLITE-USB 8 channel triple input radio ON-Air / Production mixer with 3x Mic, 4x USB and 1x VOIP. USB audio Isolator for eliminating digital (usb) background noise. Airmate Sparepartskit (faders, switches, pots, ic's etc. etc.). ON-AIR WARNING LIGHT display for AIRMATE-USB | AIRENCE-USB | AIRLAB | AXUM (incl power adapter) . Airlab-DT loaded with 6 Triple Inputs + 4 USB Triple Inputs + 2 Telco modules, 2 blanks, 1x Control Module + Software metering special set price. Airlab USB Control Module for Play-out systems. Airlab Triple EQ, (Mic/stereo line/stereo line) VCA controlled. Airlab Telco module Q (Mic/stereo line/stereo line) VCA controlled. .
Airlab Triple DIGITAL input module (Mic/AES3/s/p-dif) VCA controlled. RIAA phono pre-amp for stereo line input. ON-AIR WARNING LIGHT display AIRLAB (incl power adapter). CMS (CobraNet Management Software) under Windows . Telephone Hybrid-2 active 19" unit. Teleporter-3 with keyboard and record-out. (to be discontinued soon). PPM-260 Dual 60 segment high resolution stereo PPM meter (incl power supply and 9.5". Rack One with: 1x mic AD, 2x Line AD, 1 Line DA, 1x DD src, 1x Hybrid-4, 1x CRM. AXUM Version 3.0 upgrade including remote upload and support from D&R. REMOTE application software to create a virtual control surface or remotely control an existing control surface in the system . Redundant power supply for Control Surface Frame. 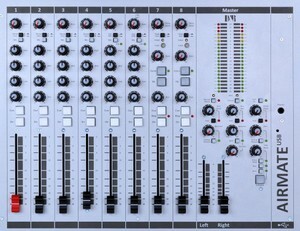 Drop through Fader section Broadcast (= 4 positions module). 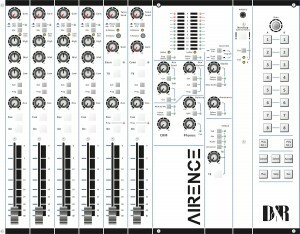 Display 16 Character, 4 rotary Encoders, 8 pushbuttons, 4 Alps motor faders, CAN buss. Blank panel-2 (= 2 positions). ON-AIR WARNING LIGHT display for AIRMATE-USB|AIRENCE-USB |AIRLAB | AXUM (incl power adapater) 19" . RACK ONE 19" Rack 1x 3HE + Backplane for 21 I/O card/slot positions. MIC A/D RJ45 (4x mic, 8xGPIO). Line A/D RJ45 (8xMono or 4xStereo, 8xGPIO). Line D/A RJ45 (8xMono or 4xStereo, 8xGPIO). CRM D/A RJ45 (2xStereo and 2xHeadphone, 8xGPIO). FireWire (16 In, 16 Out). Mic I/O 8x XLR Female input + 16x Remote + 6x jack out from 11x RJ45. Dig I/O 6x XLR Female, 6x Male XLR + 12x Jack Remote from 6x RJ45 . 38 Frame with 28 mono de luxe, 4 stereo deluxe, 4 Subgroups and Master deluxe (32-8-2). Vision 19" frame (for 13 mod.)incl. standard master and power-supply. Vision 38-frame (for 37 mod.)incl. standard master and 19" Powersupply. Vision 46-frame (for 45 mod.)incl. standard master and 19" powersupply. Vision stereo deluxe line/line module. Vision meterbridge 2VU with 2 analog VU-meters for frame-19". Vision meterbridge 4VU with 4 analog VU-meters for frame-19". Vision meterbridge 6VU with 6 analog VU-meters for frame-30/38. Vision meterbridge 8VU with 8 analog VU-meters for frame-30/38. Vision faderstart option (ALPS micro-switch including cabling). Mounting kit for mounting two 9,5" signal processors fitting 19" racks. Radiohm fader mono for Discom1, 300 series, 700-1 series, 200/Sixmix . N-ALPS horizontal stereo log 60mm fader for Clubmix/Orion. N-ALPS vertical stereo log 60mm fader for Airmate/Clubmate/Discom5. N-ALPS vertical stereo log 100mm fader for Clubmate/Discom5. K-ALPS stereo 100mm fader in 10K A (log curve). Microswitch for K-ALPS fader (for both 60mm and 100mm K-ALPS faders only).